“And it came to pass, as he was praying in a certain place, when he ceased, that one of his disciples said to him, ‘Lord, teach us to pray, as John taught also his disciples.’ So he said to them, ‘when you pray, say: Our Father in heaven, hallowed be Your name. Your kingdom come. Fully convinced that it is not only necessary to stir up people to pray but also to help them to know what to pray about, we have written the next two books in this series. The books are, Practical Helps for Praying Believers, Volume One, How to Pray for Yourself; and Volume Two,How to Pray for Your Local Assembly. 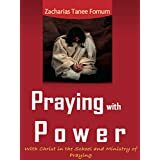 Below is a chapter from Volume One on the part, “Praying for Your Family.” Pray through them and see if they help you to be more fulfilled as you pray for your mate. Praise the Lord! Thanksgiving to the Lord for her salvation and for all the ways and all the areas of her life in which she has grown spiritually. The different ways and areas should be mentioned to the Lord in detail. Pray for her total deliverance from the self-life. Expose to the Lord, all the ways in which the self-life is manifested in her life: self-justification, withdrawal, moods, harshness, indiscipline and so on. Ask the Lord to open her eyes to those things and that she should see them as manifestations of self, hate them, seek deliverance from the Lord, receive deliverance from the Lord and remain delivered. giving accounts by the writing of all failures. learning to walk with Him after the prayer session. asking and receiving from the Lord a spirit of rejoicing in obedience. times that enable her to carry a sense of God’s presence and glory into all of the day. she should see that she will give account on Judgment Day for the way she has used each second, minute, hour, day, week, month and year. Pray that God’s call on her life should become increasingly obvious; so that she should see clearly that one thing to which God has called her, Pray that if she has not yet received the goal God has for her life, she should seek it, find it and give all of herself to it. Pray that she should organise her life in such a way that her hourly, daily, weekly and monthly goals are all a real part of the one goal God has for her. Pray that she should grow in Christian character. Make a list of the areas in which the fruit of the Spirit is underdeveloped in her life and bring each up to the Lord for rapid transformation. Pray that she should hate these flaws and be totally determined to have all of them eliminated as soon as possible. a spirit of ingratitude and the tendency to keep things that are not really needed. And that her hunger for the Lord should be deep and insatiable. Pray that she should be fully satisfied in the Lord. Pray that she should see the world for what it is: a judged system that will soon be removed, that her eyes should be fixed on heaven and that she should labour to invest everything there as soon as possible. Pray that she should live in hourly and daily expectation of the Lord and that her total person should be ready to meet Him in the air. Thank the Lord for the time of prayer and believe Him for answers to all the requests you have made to Him.